Now that Darkrai’s had its May, it’s time for something a little cheerier. June’s mythical Pokémon is the ridiculously adorable Manaphy. The Pokémon Company and Tomy are showcasing a different mythical Pokémon each month in 2016 in celebration of the 20th anniversary of the beloved video game franchise. Pikachu kicked things off in January, followed by Mew, Celebi, Jirachi and Darkrai. Now we come to one of my personal favorites, seafaring Pokémon Manaphy. Like the previous entries in the mythical months celebrations, Manaphy scores a pair of limited edition toys, this time exclusive to Toys’R’Us locations. 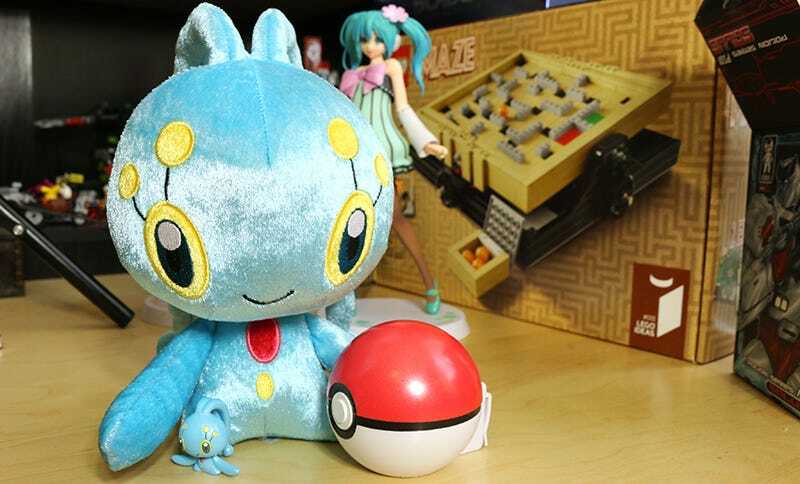 Along with a nice-sized plush and a tiny plastic figure, Manaphy also gets his own TCG pack and a limited-time distribution in Pokémon X, Y, Alpha Sapphire and Omega Ruby. I adore the plush version of Manaphy, with its shiny skin and dangling tentacle dealies. It’s a wonderful, cuddly representation of the star of Pokémon Ranger and the Temple of the Sea. The plushie’s tiny plastic companion is cute enough, though I do wish it had come with something other than the plain old Pokéball. My favorite thing about Manaphy is the fact that if you squint your eyes it’s just a fancy dress away from being a Hatsune Miku cosplayer. Coupled with the fact that Manaphy is a mythical with the ability to breed, and the fan fiction writes itself. Join us next month, when Manaphy swims back home, making way for this freakishly cute thing right here.